Wow, it’s been way too long since I’ve updated my blog on here. And not that it matters, but I thought I’d catch up on some of the stuff I’ve been up to lately. 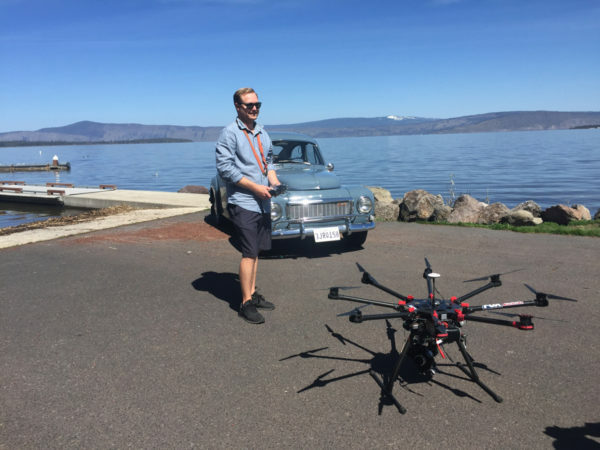 My partner in aerial cinematography Justin Chapman from Chapman Aerospace and I just recently wrapped filming for season 13 of Wheeler Dealers for Discovery Channel’s Velocity network. The entire season was a blast and took us all around Southern California, up to Oregon, and out to a solar plant in the middle of the Nevada desert. I can’t show the reel I cut together from the season, because not all of it has aired yet, but some of the shots we got we’re pretty cool, and we both learned a lot of great techniques when it comes to filming cars with a drone. Justin on set for Wheeler Dealers. Right after wrapping for Wheeler Dealers, we headed to Pennsylvania to shoot the U.S. Open of Golf for Fox Sports. We were there for a week, shot every single hole, and came home with a hard drive full of footage that Fox used during their live broadcast. Check out the reel from the week’s shoot below. If you’re in need of aerial work—drones or full-sized helicopters—contact us through the contact link on this website or visit www.chapmanaero.com. I can’t wait to see where we end up next. There are some big, exciting things planned for the future. 2016 U.S. Open of Golf | Fox Sports Reel from Lutes Digital Media on Vimeo.